Lehr thinks so and offers the 25HP as its proof of concept. to this year’s MIBS, where Lehr’s new 25HP was on display — also running inside. The first question that springs to mind: Does propane make a good marine engine fuel? all know it’s great for gas grills, but what about as a marine fuel? One of propane’s biggest assets as a marine fuel is its higher 110 octane level, which allows the 25HP to use advanced timing without knocking. Lehr optimizes performance by using special valves, valve guides and heads. Some gas-to-propane conversions, on equipment such as forklifts, only have one-stage metering systems, giving them a very narrow power band. 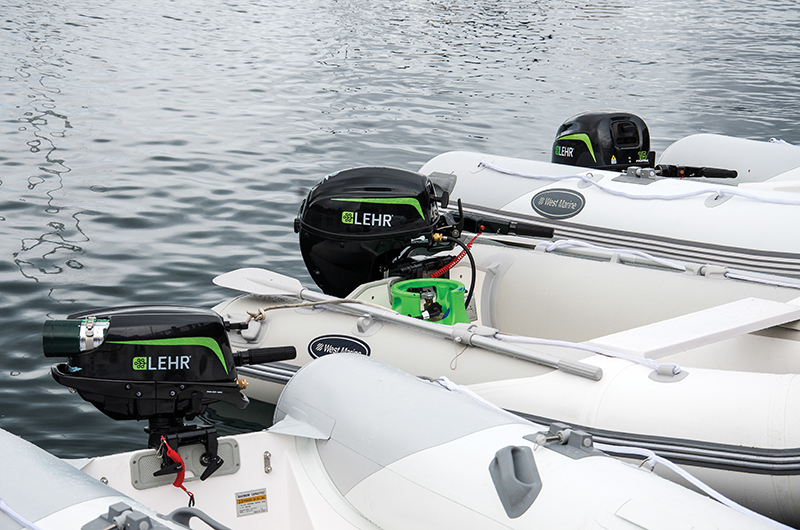 What makes the Lehr 25HP special is its three-stage, highly accurate fuel metering system that ensures a smooth power delivery in all throttle ranges. Lehr actually provides 35 companies — including John Deere and Briggs & Stratton — with proprietary fueling systems that include components such as its patented Liquid Draw. Future Lehr outboards of the larger persuasion will probably use fuel injection, but the 25HP uses a carburetor and lacks an onboard computer, which keeps the price down and makes maintenance simple and cheap (and third-world friendly). Propane is a refrigerant, so standard lines would not be at adequate, which is why Lehr uses aircraft-grade brazing and stainless steel lines, which are more durable in marine applications and help keep the liquid propane flowing until the heat exchangers expand it into a gas. In order to fit any gas into a reasonably sized container, it must first be liquefied. Some observers have wondered about the difference between liquid propane gas (LPG) and liquid natural gas (LNG), which has also been used to power vehicles. It’s simple. For propane to convert to liquid form, it needs to be pressurized to between 100 and 150 psi or have its temperature lowered to minus 40 degrees Fahrenheit. For LNG to liquefy, its temperature must be dropped to minus 260 degrees Fahrenheit or be pressurized to 3,600 psi. This is why natural gas is run into homes via a pipe rather than delivered to a home tank like propane. The cost? When I get my grill’s 20-pound propane tank filled, it costs about $20, which works out to around $4 a gallon. It would be great to get a 150-gallon tank installed at home and buy in bulk to refill the lightweight seven-and-a-half-gallon Lehr-designed composite tank, but there’s a catch: A pump assembly capable of handling liquid propane costs around $10,000. So unless you have a fishing fleet or a co-op, this isn’t practical. With gasoline prices around $2 nationwide, right now propane is more expensive. One huge advantage to owning a Lehr 25HP is that propane doesn’t go bad like ethanol-laced fuel, so it doesn’t need winterization. Harmful emissions are lower, too, with up to 60 percent fewer hydrocarbons, which prevents sooting within the combustion chamber. Since it’s not a solvent and enters the combustion chamber as a gas, it doesn’t strip the cylinder walls of lubrication, which extends engine durability. Propane doesn’t have the evaporative issues of gasoline and is not a greenhouse gas. According to recent Lehr performance tests, the 25HP burns 1.1 gph at 3000 rpm and 2.5 gph at 5000, which is slightly more than most state-of-the-art gasoline four-strokes. At 172 pounds, it weighs slightly more than most four-strokes, such as the Honda BF25 (155 pounds), but it is cheaper than the Honda ($4,295 vs. $5,799), and it can be equipped with an internal lithium-ion battery for push-button, no-choke starting. Is propane the marine fuel of the future? 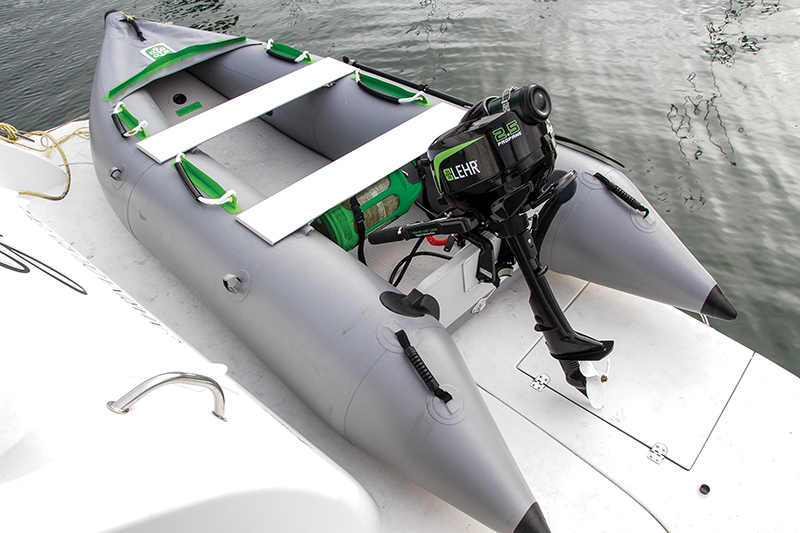 Too early to tell, but it is a viable and interesting option, especially for boat owners who don’t use their motors very often or don’t want to deal with the hassles and hazards of gasoline.